When the chief priest asked him if the allegations were true, Stephen proceeded to give the religious leaders a lesson in Bible history (Acts 7). He starts with Abraham, moves on to Isaac, Jacob and Joseph. Then he comes to Moses and reminds the council of the burning bush and the exodus. He reminds them of the people’s apostasy when they turned against Moses and worshipped the golden calf. He reminds them of the tent Moses built in the desert, which became the model for the temple Solomon built in Jerusalem 300 years later. Before dying, Stephen experienced an ecstatic vision of the heavenly Christ. He was inflamed by divine love. But there is a short epilogue: And Saul was consenting to his death…Devout men buried Stephen, and made great lamentation over him. But Saul was ravaging the church, and entering house after house, he dragged off men and women and committed them to prison (Acts 8:1-3) This is the Saul who also received a vision of Jesus – “Saul, Saul, why do you persecute me?” (Acts 9:4) This is the Saul who after this vision became Paul, the great apostle. 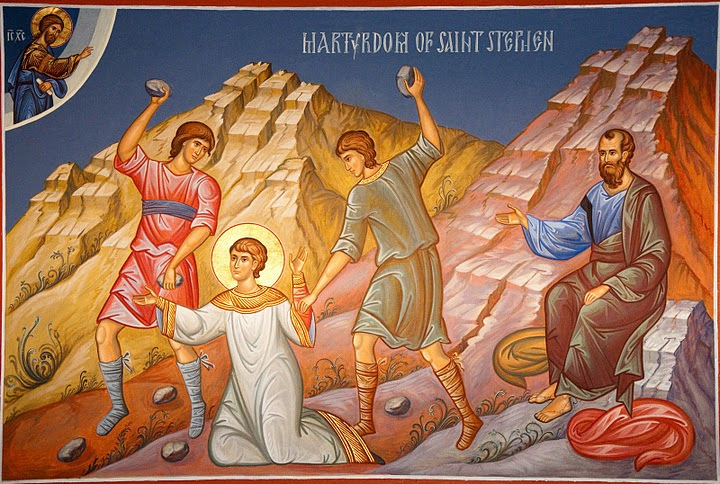 Stephen’s martyrdom. Saul (later to be Saint Paul) is shown approving the stoning of Stephen. Unfortunately the icon is rather bland and does not capture the intensity of Stephen’s visionary experience. Paul’s own heart was animated by the same divine love that filled Stephen. Agape is the word that Paul himself uses for love in his letters. But the love that filled Stephen and Paul perhaps is better described by another ancient Greek word, έρως. There are four words for love: έρως (eros), φιλία (philia), στοργή (storge), αγάπη (agape). The Fathers of the Church habitually used the word έρως in addition to αγάπη. Αγάπη is a wonderful word to describe that unique form of Christian love that is self-giving and works for the good of others, and describes God’s own love in sending Jesus to us. But έρως connotes something different, an intense, ecstatic love of personal devotion, infatuation even, that I believe describes both Stephen and Paul. Listen to how Chrysostom describes Paul: “the red-hot lover of Christ” (ο διάπυρος εραστής του Χριστού). Chrysostom himself came under the spell of Paul. Chrysostom, who lived 300 years after Paul, believed that his own love for Saint Paul would be added to Saint Paul’s burning love for Christ and God. Today, December 27th, is the feast day of Saint Stephen, and he invites us to share his ecstatic vision and love of Christ. This is why we love the saints – especially saints like Stephen and Paul. We want their burning love for Christ to spill over unto us. We want our love for Christ and for each other to be added to their love, their έρως and αγάπη and φιλία and στοργή. In these four words perhaps we can sum up the good news of Jesus Christ, for which St. Stephen lived and died and lives again. Categories: Radical Christian Thoughts, Sermons | Tags: agape, eros, Saint Stephen | Permalink.